The family of a 21-year-old Windsor man killed in a car crash says the sentence the driver received is not enough. Darnell Scanterbury died in April 2008 when the car he was a passenger in smashed into two trees, throwing Scanterbury from the vehicle and into the side of an apartment building. The car broke apart, spreading debris for blocks. Barker was driving 89 km/h above the speed limit and had twice the legal limit of alcohol in his blood when he crashed the car into two trees, killing Scanterbury. 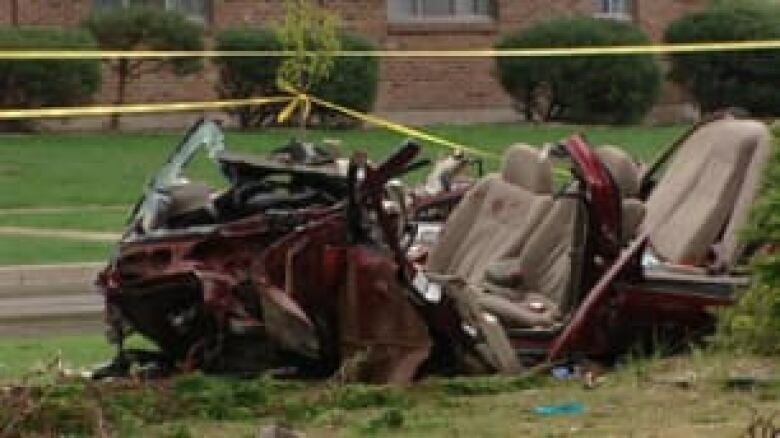 ((CBC)) Behind the wheel was Scanterbury's good friend Jordan Barker, 24. On Tuesday, Ontario Superior Court Justice Bruce Thomas sentenced barker to 19 months in jail and three years probation. Barker had pleaded guilty to impaired driving causing death. "I'm ready to accept my role and take responsibility for it," Barker told the court. Barker and Scanterbury were among five friends who had spent the night out celebrating after one of them had just learned he was going to become a father. When Barker smashed the red Oldsmobile Alero into the trees, he was driving 89 km/h above the speed limit and had twice the legal limit of alcohol in his blood. Barker's lawyer, Patrick Ducharme, had asked for a nine to 12-month sentence, while the Crown suggested two years less a day. Scanterbury's mother, Hyacinthe Blake, said the sentence should have been longer than 19 months. "My son was a person, a human, and he did not just die, he was killed because of a selfish act," said Blake. Krystal Pentz, shown here with boyfriend Darnell Scanterbury, gave a victim's impact statement at the sentencing of the man convicted of killing Scanterbury. ((CBC))The maximum sentence for impaired driving causing death is life in prison. Family friend Debbie Marentette said the two-year wait for a sentence has been difficult for everyone involved. "Going to court, meeting with crown attorneys … all these things in a drinking and driving incident is extremely hard on the family, because there are enough sad days, but going through that we have more sad days, " said Marentette. There were sobs coming from both sides of the packed courtroom as the judge heard victim impact statements, including one from Krystal Pentz, Scanterbury's girlfriend and the mother of his young daughter, Jasmine. Pentz told CBC News after the sentencing that she felt 19 months was not a harsh enough sentence. "I think it's a lot of bull," she said. 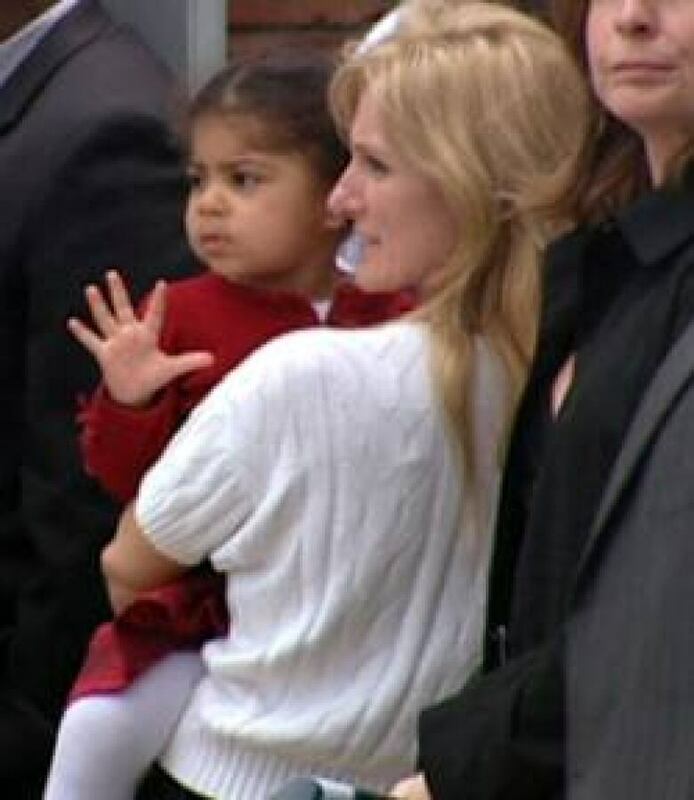 Scanterbury's daughter, Jasmine, shown here at her father's funeral in April 2008, has had trouble sleeping since the accident. ((CBC))"I think that people live in Canada, they think it's such a great place, but it's been proven you can get away with murder. I was hoping for the two years less a day. I know that he's only going to serve about one third ... it's just you take a life and then you go to jail for a few months and all is said and done. It's not fair." Pentz says Jasmine has had trouble sleeping since the crash. The young mother says there is a lesson to be learned from her boyfriend's death. "If you want to drink and have fun, do it at home," she said. "And when you have a family, just grow up."